We followed up the Oslo Whiskyfestival with a short cruise to Fredrikshavn, and with 12 hours ashore, we decided to take the bus down to Ålborg instead of hanging around Fredrikshavn. In Ålborg I had noted down a couple of shops I wanted to visit, and one of them was Tiger. They had a lot of almost interesting things, but very few interesting enough to tempt me, but I did find some more wall hooks, or coat hangers or whatever you’d call them. 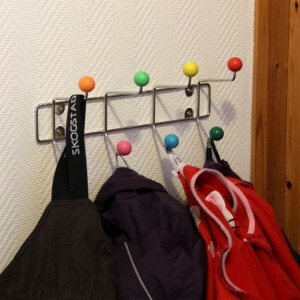 Blatant rip-offs, obviously, and normally I don’t hold with buying designer rip-offs, but what with the problems I’ve been having finding any hooks I like and that actually work, in that it’s possible to hang something on them and expect that it stays there, I thought I’d go for them. Also, they were only 30 DKR each. Later the same day I saw some others, also quite blatantly rip-offs, more or less identical, at 6 times that. I mean, if you’re buying rip-offs, why pay more than you have to? See: More than two garments, and bulky ones at that. And still there's room for more! 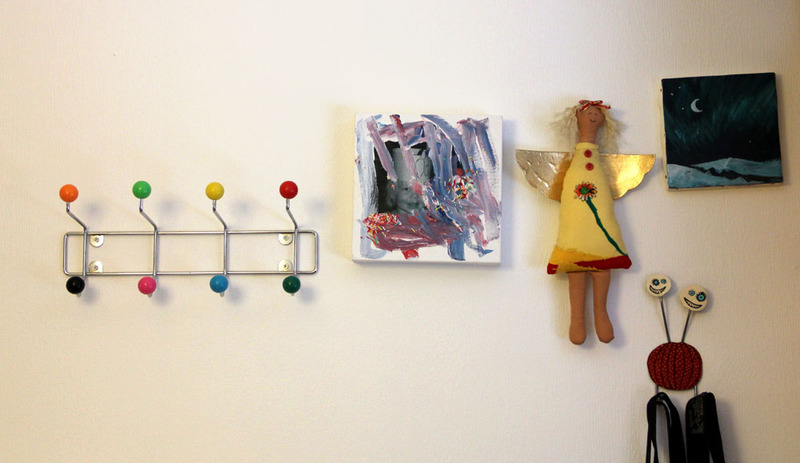 The crooked (my fault, I haste to add) picture is a present from Tonbel, the angel from another good friend and the messy artwork is the lass’ “creation”, with rather a lot of help from the daycare staff.